a direct, surgically created, arteriovenous fistula; used to facilitate chronic hemodialysis. Michael J., U.S. nephrologist, 1933–. 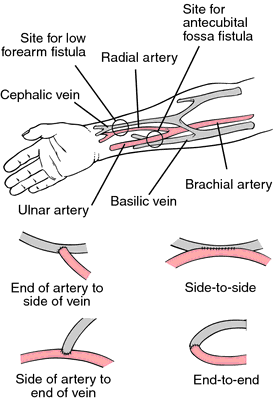 Brescia-Cimino fistula - a direct, surgically created arteriovenous fistula used to facilitate chronic hemodialysis. James E., U.S. nephrologist, 1928–.